There is nothing more effective at removing bacteria from the hands and forearms than wiping them dry with a cloth towel. If a hand is not properly dried, the bacterial count can increase dramatically, and research has shown that no-one spends the required 10-20 seconds drying their hands under air dryers. In fact, warm air dryers have been shown to increase bacterial presence by 189%, with cloth towels reducing the count by around 85%. Continuous cloth towels are encased in a dispenser, which hides the used section of towel from the outside world. What this means is that the bacteria-infected fibres can not be disturbed until it comes time to remove the towel roll and have it cleaned. In contrast, paper towels sit crumpled in bins, often uncovered, allowing for natural air flow to lift bacteria up and around the washroom. Meanwhile, research has proven that air dryers can blow bacteria up to a 2-metre radius from the dryer, thereby spreading contamination too. Learn more about continuous cloth towels (PDF 483 KB). Obviously, there is no electricity used when operating a continuous cloth towel dispenser, so regardless of the energy efficiency of a modern air dryer, it can’t beaten. Sometimes the tried and tested is better than the so-called new and improved. This is particularly true when it comes to making your office a healthier and more environmentally friendly place to be. The washroom, that vital facility that is synonymous with the concepts of cleanliness and hygiene. With the modern jet air dryers popping up everywhere, it’s tempting to believe that powerful jets of air leave the hands drier and more hygienically clean. But in fact, research comparing them to the old favourites show that new tech option is not actually all that. The greenest and most hygienic mode to dry hands is the continuous cloth towel dispenser. Given that a cloth towel is cleaned and reused around 100 times, production costs are lower overall, while the fact that they are recycled as wash cloths lessens the environmental impact. In fact, compared to disposable paper towels, the reusable cloth towel uses 63% less energy, generates 48% less greenhouse gases and creates 79% less waste. Everyone wants a cleaner, greener and healthier place to work, and washroom hygiene is a key factor in accomplishing that. It is refreshing to discover that the originals are still the best. A comparative study of three different hand drying methods: paper towel, warm air dryer, jet air dryer’ by Keith Redway and Shameem Fawdar of the School of Biosciences, University of Westminster London. The School of Biosciences at the University of Westminster (March 2007) compared the reduction in bacteria on the hands after using cotton towels, paper towels and warm air electric hand dryers. 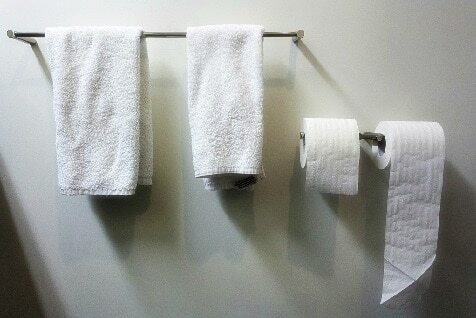 An international study has shown that most of the people prefer to dry their hands using cloth towels than using paper alternatives. Continuous Cloth Towel offers important benefits with less impact on the environment. Research has also shown that using cloth towels is effective hand-drying technique at removing bacteria. Here in Fresh & Clean, we will be glad to provide your places with a completely managed cloth towel dispenser rental program, tailor-made to your individual requirements.